The IT and IT Enabled Services (ITES) industries have been one of the key driving forces fuelling India’s economic growth, contributing more than 9% to India’s GDP in 2016. Overall, the industry employs nearly 3.7 million people across 16,000 firms, and the IT share in the country’s total service exports amounts to more than 45%. According to the European IT observatory EITO, ICT sales growth in India has slowed down, from a whopping 11.9% year-on-year in 2015 to 4.7% in 2016. In 2017 a 5.2% increase is forecast. In an international comparison of ICT markets, India continues to lead in terms of growth rates. The IT industry in India was estimated to amount to USD 160 billion in 2016. The IT services segment has a 47% share, followed by business process management (BPM) with an 18% share, engineering, research and development (ER&D) and packaged software (16%) and hardware (8%). The e-commerce market was estimated at USD 17 billion in 2016, a 21% year-on-year increase. The Indian ICT hardware market amounted to USD 18.25 billion in the financial year 2015-2016 , mainly due to increased sales of phablets, smartphones, notebooks and printers. Key growth drivers are improving economic indicators, growing disposable income, penetration into rural markets, tier 2 and tier 3 cities, online and digital marketing, the e-commerce boom and the government’s reform initiative for the sector. By 2020, India’s IT-BPM sector´s total revenue is projected to reach USD 200-225 billion and USD 350-400 billion in 2025. 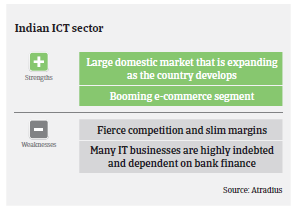 However, despite the robust growth rates, stiff competition, pricing pressure and cheap imports remain key challenges in the domestic ICT market, especially for smaller IT resellers and distributors. Those are mostly partnership/proprietorship companies, working on very low margins and often with liquidity and solvency issues. In the IT distributor segment non-payment notifications and credit insurance claims increased in 2016. Our underwriting stance is generally open for larger IT distributors and software/hardware service companies as well as IT service companies that are either publicly listed or privately owned by strong established groups. However, we are more prudent with the IT distributor segment and smaller partnership/proprietorship firms that are not obliged to file their annual accounts with the Registrar of Companies (ROC), and which are usually unwilling to share that information with third party information agencies. 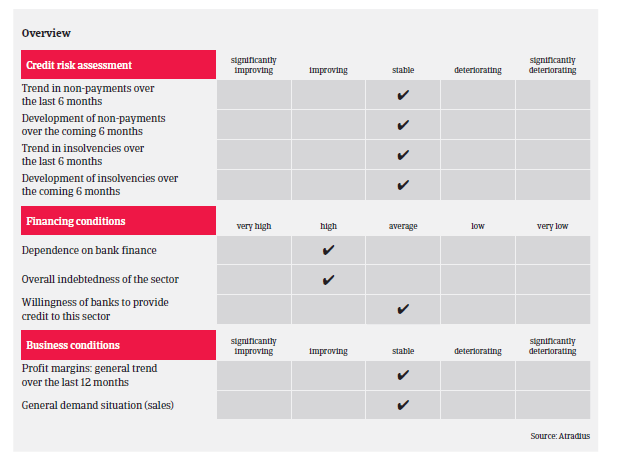 In our underwriting process we take into account the trading history, customer profile and credit management capabilities of single buyers.